RepRisk Company Reports provide an in-depth look at an individual company's environmental, social, and governance (ESG) risk exposure. What is the RepRisk Company Report? RepRisk Company Reports are designed for users specifically interested in one or a few companies, including CSR and sustainability teams, Communications and PR professionals, Financial and M&A advisors, Law firms, Management consultants, and NGOs. A summary of RepRisk analytics and metrics that capture and highlight the areas of ESG risk exposure of the company, for both a two-year and a ten-year timeframe. Details of all the individual ESG risk incidents (news) related to the company, since the launch of the ESG Risk Platform in January 2007. Company Reports are dynamically generated at the time of purchase to include the latest information from the RepRisk ESG Risk Platform – the world's most comprehensive database on ESG risks. All you need to know about the Company Report is available in our factsheet. Get a first-hand look at the Company Report by downloading a sample. Do you want to benchmark your company? The RepRisk Benchmarking Brief is a corporate benchmarking report that assesses your company's exposure to ESG risks, and benchmarks it with a customizable peer list. Purchase a RepRisk Company Report with a RepRisk Benchmarking Brief and benefit by saving 25 percent off the price of the Company Report. RepRisk Clients with access to the ESG Risk Platform can order a Company Report for their own company at no charge; to request, please contact, report@reprisk.com. RepRisk Clients benefit from a special price of CHF 900 for the Benchmarking Brief. A customizable corporate benchmarking report that assesses the ESG risk exposure of your company and your peers. Learn more about how we can help you manage ESG and reputational risks in day-to-day business. 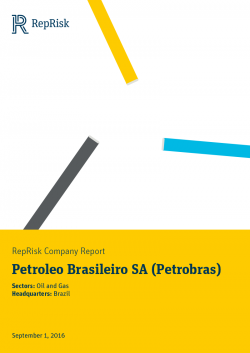 RepRisk publishes Sector Benchmarking Reports that rank companies within each sector using the RepRisk Rating.